Well, it has turned cold here in Kentucky and the whitetail deer rut report has been the same from most of my friends in different states. The bucks are moving good and chasing does hard the past couple of weeks. I’ve seen some really nice bucks being taken from several different states. I have heard of several nice bucks being killed in Kentucky the past two weeks and all of them were chasing or following does. One of my friends got up late and headed to his stand around 8 am and encountered 3 bucks chasing does while heading to his stand. He was able to make a good shot on the third buck which ended up scoring 166″. The same day his hunting buddy killed a nice 10 pointer chasing a doe on the same lease. Another friend of mine killed a very nice big 12 pointer in Kentucky and he was chasing a doe as well. These bucks are in pursuit of this doe in heat. I got a deer hunting update from Kansas, Missouri, Georgia and Illinois and the weather is cold and the big bucks are chasing does. A friend of mine in Georgia sent me some pictures of a 150″ buck he is after but he hasn’t gotten him yet. 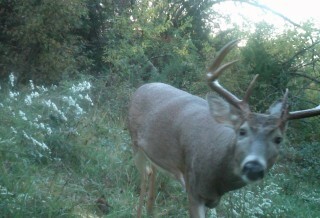 Although he is getting daylight trail camera pictures of him. I just love this time of year seeing all the big bucks taken and hearing all the stories about how they got them. How about where you hunt? What has the rut action been like for you? 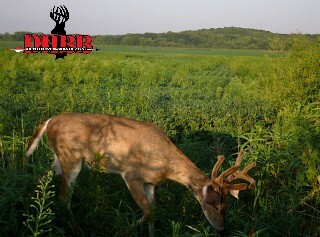 Send us some pictures of your bucks and share your whitetail deer rut report with us. We would love to hear how your season is going where you hunt. Hopefully everyone is having a fun safe deer season and either getting some meat or killing that trophy buck of a lifetime or just enjoying time spent in the great outdoors with family and friends. It’s the most wonderful time of the year. Nice buck on public deer hunting land. There is a lot of really good public deer hunting land out there. I grew up hunting public land and it has it’s pros and it cons but if you are willing to do some work you can find some really good spots to hunt. I am actually planning on hunting some public land in Kentucky this deer season and I can’t wait. I just wanted to list some quick links that are great resources for public hunting land that give you all the information you may need when researching to find public deer hunting land. Hopefully these will be helpful to some of you looking for information on different states public hunting areas. The following are links to help you find information on different states public wildlife management areas etc. These are some good links to start looking for information on public deer hunting land. If you do a little research you can find some really good places to hunt. The thing is when hunting public land is you have to be willing to get off the beaten path and go where the other hunters are not willing to go. Sometimes that may mean putting in extra work by getting further back in the woods where the hunting pressure isn’t so heavy. Those big bucks didn’t get big by being dumb. The heavier the pressure the harder they are to kill. So find locations where other hunters aren’t willing to go and that’s where the big boys will be hanging out. When researching places to hunt look for areas that have food water and cover and a past history of big bucks being taken there. I’m not going to lie, it is not always a bed of roses when hunting public land. I’ve had hunters come in and climb up a tree 75 feet away from where I was already set up in a tree and I’m shining my flashlight at him to let him know I’m there and he hunts there anyway. To say the least I was frustrated that morning. That being said, if you are willing to do your homework and get back in them woods you can find your buck of a lifetime hunting public land. I’m going to try and do just that this year hunting in Kentucky.